This straightforward, attractive condominium apartment building is part of a crop of new buildings along Broadway that sprang up in the 1980's that made an effort to relate to the existing architectural context. Designed by Schuman, Lichtenstein, Claman & Efron, this rather boxy, 17-story is typical of much construction of the period: clean-cut, simple and efficient. The architects have thrown in a number of bay windows and chamfered corner windows to add some interest. 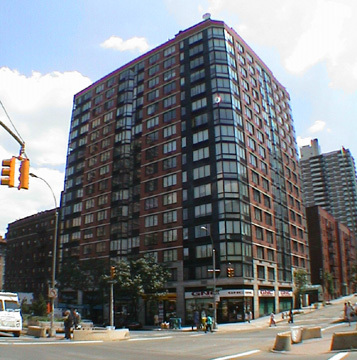 The 213-unit building has a sundeck, storage space, a bicycle room, concierge, video security and valet service and was designed for people who do not need large apartments, want the standard package of "luxury" amenities" and enjoy the ambiance of the Upper West Side and Broadway and value the economics of an address this far uptown. The developers were William Zeckendorf Jr., Jerome Chatzky and Ernest S. Alson.